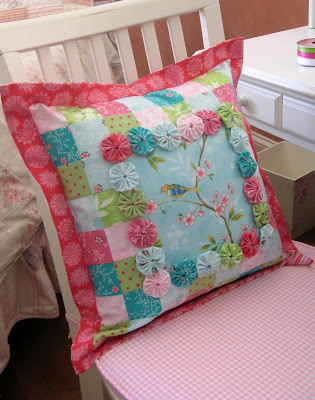 Amanda Murphy Design: "Springtime Yo-Yo Pillow"
A free pattern for my "Springtime Yo-Yo Pillow" is now available. It is the perfect project to use up all those beautiful bits of fabric that we have in our stash and can't bear to get rid of. 5 yards, 5 fabrics, 5 projects!